The AEV Crestone DualSport Wheel is designed specifically for late-model Tacoma, 4-Runner and FJ Cruiser. The Crestone’s split 6-spoke design gives it an ultra-modern look while providing drivers with the flexibility and versatility that AEV’s line of DualSport Wheels are known for. 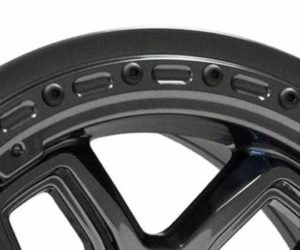 This wheel can be purchased with a fully-functional Beadlock Ring for running very low air pressure off-road, a Protection Ring for street use and added protection off-road or no ring with black hardware for a more simplistic look. The DOT-compliant AEV Crestone DualSport wheel is made from heat-treated A356 T6 cast aluminum for maximum strength and has been thoroughly tested to stringent SAE J2530 standards. This wheel is also Tire Pressure Monitoring System (TPMS) compatible and features AEV’s signature valve stem recess to protect the tire valve from being damaged while you are out on the trail. AEV’s Crestone wheel measures 17×8 w/ 4.69″ backspacing and will work without having to remove the axle dust cap commonly found on many Toyota trucks and SUV’s. This wheel is available in a painted Onyx finish. Beadlock/Protection rings are available in either a painted Silver or Onyx finish. and can be painted for a truly custom appearance. 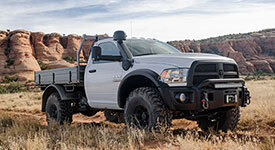 The Crestone was designed specifically for late model, 6-lug Toyota applications, such as Tacoma, 4-Runner, FJ Cruiser but it may also fit other makes and models. Please refer to the tech specs for additional information and specifications about this wheel. 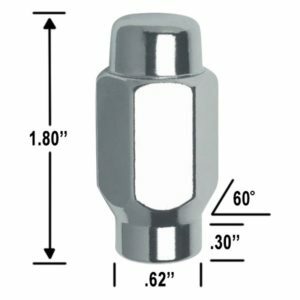 A 13/16″ ET style lug nut will be required for most Toyota applications (see image below).